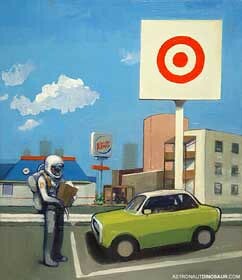 "ASTRONAUT BUYS HIS GROCERIES" is a fast fiction based on a painting from Scott Listfield which begs the question, "Would you get air-conditioning installed in your helmet if you spent the summer in an astronaut suit in New York ?" Scott Listfield has had heaps of well deserved praise for his paintings of an astronaut walking through various hum-drum locales. Oh, and there are occasional dinosaurs, too. effect. Next to her, the digital price display flashes numbers as she swipes food items across her scanner. The customer listens to her while watching her groceries total grow. "Well I read in the National Enquirer that he broke some rules up there in space. There are laws up in space just like anywhere else. You can't for example ... bring back undeclared items. He tried to sneak back some moon rock or something. His punishment is that he can't take off his space suit. It's a kind of house arrest," the customer says all this leaning into the cashier all the while keeping her eyes on the growing total of groceries. 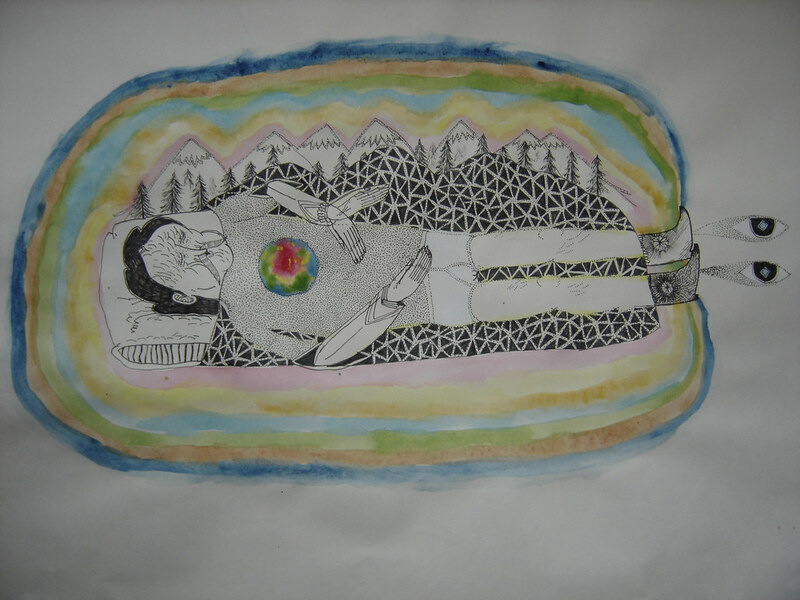 "A house that you carry with you." Outside, the astronaut fumbles for his car keys while trying to keep hold of a bag of groceries. "Crud," he mummbles, dropping his ring of keys. The world watches and waits as rumours orbit around him like an excess of moons. Good one. A really good story. I loved it.